Because they were doing this to my poor Den. You know those moments when you look at something that is in-progress and you think to yourself, OMG, wait, this can-NOT be right, time out, let’s think about this…! I had that moment late this morning, when I was on a call and there was this tremendous whump from the construction area and then I heard something crash in the kitchen. Later, I discovered that it was the kitchen knives, falling off their magnetic holders; apparently, having the other side of the wall they are on, you know, ripped off the house was a little too much vibration for them to maintain a good grip on the knives. And then I had one of those little walks down memory lane, remembering that phase Captain Adventure went through some years ago as a toddler, where we could not keep his chubby little mitts off the blasted kitchen knives. He was fascinated by them. I tried putting them into a child-“proof” drawer => he’d have them out in under five seconds flat. I tried “hiding” them in a child-“proof” cupboard => hahahahaha, yeah, how’d THAT work out?! I tried the top of fridge. I tried keeping them in the den. Eventually, I got that magnetic strip, hung it over the stovetop, which is a terrible place to put your good kitchen knives but as much as he looooooooved to play with my knives (!!! ), he was afraid of that stovetop. He wouldn’t go within a foot of it. Voila. He never went after the knives again. Although he did pitch a few huge temper tantrums about their new location; he’d sit on the floor, tilt his head back and just howl about it, occasionally looking at them out of the corner of his eye with undisguised longing and despair. And would go absolutely pink and purple with fury if I tried to offer him something like, you know, a spatula, or a toy knife instead. You insult my intelligence, woman! Begone, and take your lousy imitation-of-life with you! According to theory, all of this stuff – and there’s rather a lot of it, let me tell you – is going to magically become walls…and the first story of our two-story addition will be framed. Another thing that took an awful lot of effort from me…well, they needed to make room for what-all they’re doing and their supplies and such-like. So they did this. I KNOW, RIGHT?! I TOO CAN HARDLY STAND THE HORROR OF THIS…oh…you…don’t see it? Not at all? Nothing jumping out at you? Like maybe a slight difference in, you know, texture, front v. back parts of this pile…? AW, C’MON. The back of this pile is just dirt. It’s (some of) the just dirt they dug out so they could pour the concrete slab that is currently mocking my ripped-out outer walls with its pristine newness. 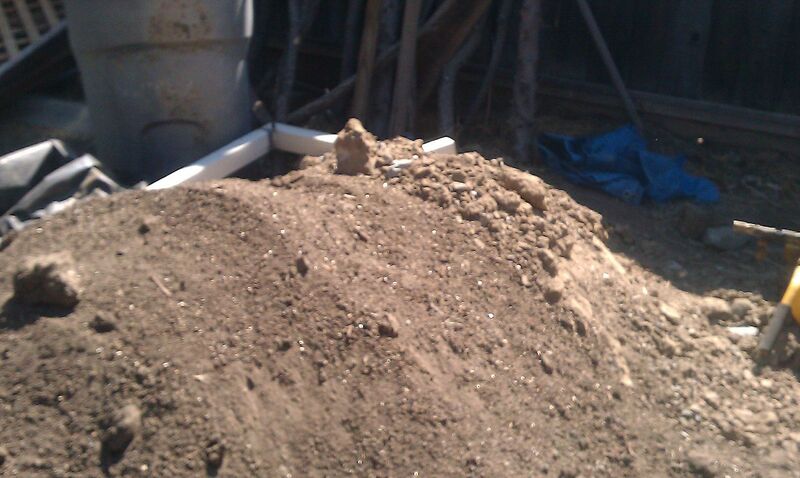 But the front pile, the one they so cavalierly hurled atop the just dirt one they made last week…that…is my garden bed soil. It is a magical blend of just dirt and compost and peat moss and you do not want to know how much time and sweat and tears (OK, fine, in the interest of full disclosure, any actual tears in there were probably caused by my sunscreen dripping [or being wiped] into my eyeballs) went into making it into that frothy confection suitable for growing ruler-straight carrots or big, round-globes onions or, you know, whatever. 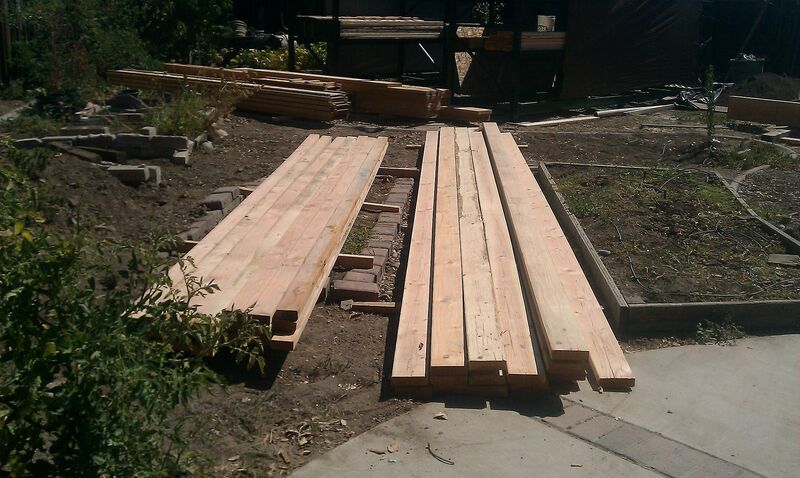 Of course, it is also garden soil that isn’t going to have a bed to go into for quite some time; even after they get this first story frame up off the ground, the second story is just going to be rush-delivered right into the same spots. Still. I keep looking at it, every time I go out there. That is some awfully nice soil, right there, I think to myself. And then I just kind of look around the yard…surely there must be somewhere out of harms way where I could get, you know, a small-ish new bed built, right? Danger Mouse had a dentist appointment today, to get some fillings. The husband made the mistake of sending me an email asking me how it had gone. Ten minutes later, I’m still standing there, clutching her pink excuse slip. The bell for the next period rings. Kids are milling around in vast numbers. No Danger Mouse. Where the heck IS she? I go back to the window and go, “Uh…?” and they say, rather pointedly, “She’s on her way.” Oooookayyyyyyy…I go back to waiting. No. She walked over to the PA system and went, “Murfle-purfle blissabloss? Pssssst tegere wah-wah sssstic...” over the craptastic speakers in the locker room, where a herd of chatting teenage girls were making themselves ready to rejoin society. IMPORTANT NOTE: none of these chatting girls were Danger Mouse, because she, AS THIS SAME LADY HAD SAID WHEN WE CALLED, was sitting on the benches, waiting (im)patiently for her mother to arrive. Outside. Where the PA system isn’t. Not that anyone can ever understand anything said over the PA system anyway. But it is even less understandable when the announcement is being made, you know, where you AREN’T. OTHER IMPORTANT NOTE: Banging your head repeatedly against the brick facing of the school is not advised. It causes not only a pounding headache, but the roughness of the brick tends to break the skin more than, say, a keyboard or a desk does. #ProTip. As we’re driving over, Danger Mouse informs me that she was more than a bit puzzled that I hadn’t shown up and almost went to the office between 3rd and 4th period just on general principle, but then reasoned that she should just keep doing what she was supposed to be doing and wait for instructions, which was of course the right thing to do, so I went, “Oh. Well. That was the right thing to do. Wish you had just gone to the office, though.” Which is sending her mixed messages which is the opposite of good parenting. But I figure at this point my cover is blown anyway so I might as well send mixed messages, belch loudly and blame it on the cat, maybe teach her how to light one cigarette with the end of another to save both time and matches, oh, and, how to identify the scaredy-cat kids so you can trick them into betting their lunch money on a game of mumblety-peg because they will pretty much ALWAYS chicken out before the first cast, thus giving you extra pocket change without any real danger to life or limb from the pocketknife-tossing thing. Brilliant. Two days ago, late in the afternoon, there was a knock on my door. I opened it up to find a pleasant man standing on my porch with a shirt that said “Windmill Septic” on it. Over his shoulder loomed a very large truck. With a very large porta-potty on it. This was, briefly, a terrific shock to me. 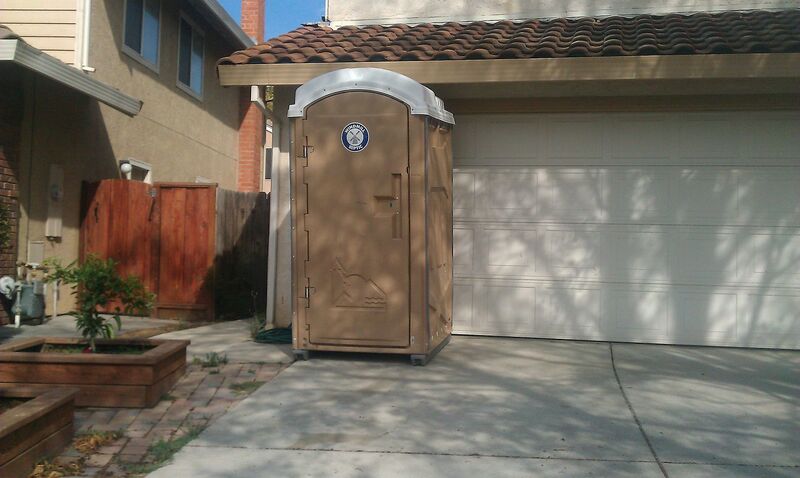 Why in the WORLD are they renting a porta-potty?! I thought to myself. “They” being the crew who are going to be providing a wide variety of noise, dust, destruction, bills and construction that will ultimately lead to the addition of one new bedroom and a loft area upstairs, and one new home office downstairs. I keep telling myself this. Because otherwise, I will go completely mental, long before we get through this. Then I realized that I was being rather stupid. Contrary to how it feels to me most of the time, I am not, in point of fact, “always” home. Asking some poor guy to just hold that thought for who knows how long while I’m in actually in the office, or running errands, or who knows what for who knows how long is a bit much. “You having some construction done?” he asked. You know how sometimes, you have these moments where you desperately want to say something that you know is probably not the nicest thing you could say right then…but oooooooooh, you’re just DYING to SAY it? “Yes, yes we are,” I said instead. “So, where do you want this?” he asked, gesturing at Tiny. 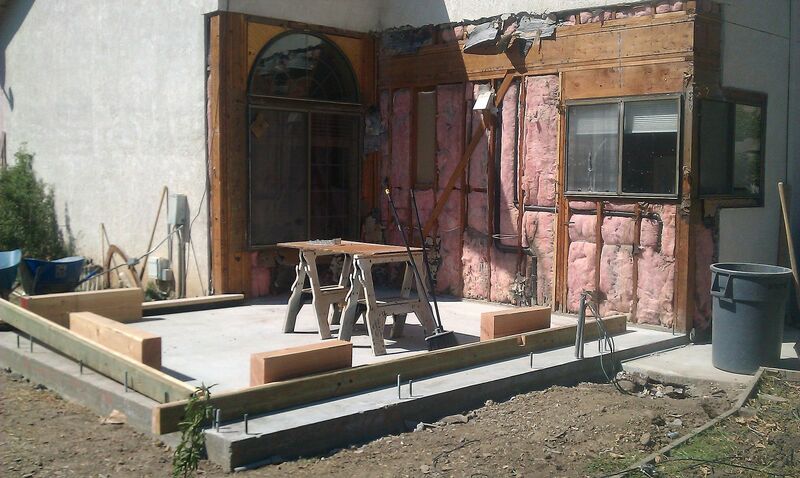 I turned and pointed to the construction site – in the backyard. “That would probably be the most convenient for the guys, and least likely to become…ahem…a neighborhood ‘attraction’” I suggested. Bam. RIGHT in front. Helllloooooo, World. This is going to be…a really fun project.